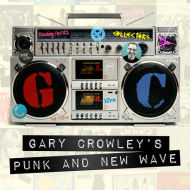 We were pleased to see Gary Crowley’s upcoming “Punk & New Wave” box set, which features over 70 tracks from 1977-1982, includes “Downtown” by The Cuban Heels. Released in 1978, this cover of the 60s classic features Davie and Laurie on drums and guitar. The box set will be released Friday 15th September 2017 and can be pre-ordered now on CD and download from Amazon: amzn.to/2ubCyTq and iTunes: apple.co/2tQF56l.